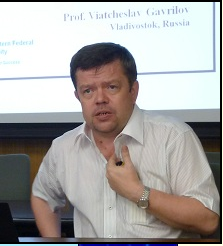 Viatcheslav V. GAVRILOV, PhD, SJD, Professor of International Law. Was born in Nakhodka (USSR) in 1963. He is a heard of the International Law Chair and Director of the Master Programs of School of Law at the Far Eastern Federal University (Vladivostok, Russia). He received his PhD in Juridical Sciences from Kazan State University in 1994 and his JSD in 2006. The title of his doctoral dissertation was “International and Internal Legal Systems: Notion and Main Directions of Interaction”. He is the author of many scientific publications devoted to actual problems of international public and private law, including two monographs and textbooks International Private Law: Course of Lectures; International Law. General and Special Parts (in co-authors); and International and Interstate Protection of Human Rights (in co-authors). His articles were published in such authoritative Russian and foreign legal magazines, as State and Law, Journal of Russian Law, Moscow Journal of International Law, International Public and Private Law, Law and a Policy, The Russian Year-Book of International Law, Eurasian Law Journal, Soochow Law Journal, Asia Law Review, Cuadernos Constitucionales US-China Law Review and Nagoya University Journal of Law and Politics. He was invited as a speaker and has participated in numerous of international conferences and programs in the US, China, France, Hungary, Taiwan, Spain, Indonesia Malaysia, Philippines, Cambodia, India and Japan. He is also a member of the Executive Committee of the Russian Association of International Law, member of Asian Society of International Law and co-founder and attorney of the Board of Lawyers “Etalon” in Vladivostok. In 2010-2011, he was a member of Study Group on the Responsibility to Protect of the Council for Security Cooperation in the Asia Pacific. From May to August of 2011, he was invited to the Center for Asian Legal Exchange (CALE) at Nagoya University, Japan as a Visiting Professor and conducted the research project “Framework of the ASEAN Plus Three Mechanisms Operating in the Sphere of Economic Cooperation”.